Thievery is nothing short of annoying. It comes in many forms that range from complex embezzlements down to that pesky squirrel that steals food from your bird feeder. Regardless of the circumstance, nobody likes getting stolen from — especially when you fail to nab the culprit. Squirrels are agile, small, and what’s worse is that they can climb trees to escape your impending judgment. Now, what we humans lack in physical attributes we make up for immensely in innovation and resourcefulness. 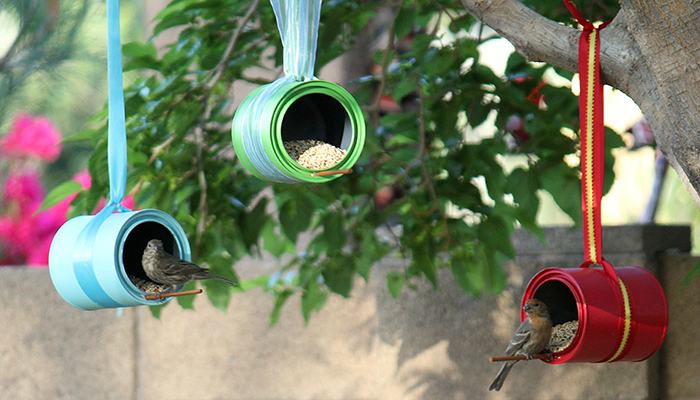 Here are some of the best ways that you can keep that furry little thief from scurrying away with your bird food. Squirrels are excellent climbers and they can easily climb metal and wooden poles. With that in mind, avoid these materials when building your bird feeder. It has been found that squirrels have difficulty in climbing poles made of PVC and copper. Make them work for their loot. While squirrels eat most types of bird seed, they seem to leave safflower seeds alone. Birds still eat the seed, so with this mind, try changing the type of seeds you give your birds. Raccoons and rats also seem to ignore safflower seeds. Suspend your bird feeders on spinning hooks. The effects are obvious. Any squirrel that tries to steal from you gets a free, albeit disorienting, ride. Squirrels have been scientifically observed to be unable (or unwilling) to jump more than 5 feet from the ground and are hesitant to land onto a bird feeder that has a 9-foot drop between it and a tree. Place your bird feeder strategically with this information in mind and you’re sure to discourage most squirrels from even attempting theft. Innuendos aside, adding grease to a metal pole makes it so that squirrels simply slide down the pole. Their claws provide no traction and the oil simply lets them slide down. The best part is that everyday oil such as cooking oil can be quite effective. A squirrel baffle is a device that’s designed to keep squirrels (and other small bird-seed-stealing mammals) from climbing up pole-mounted bird feeders. These devices act as obstructions and are extremely effective at keeping those furry thieves at bay. Just make sure to mount your baffle more than 5 feet from the ground to keep squirrels from simply jumping over your baffle. Sometimes, you unwittingly leave open invitations for these pests to steal from you. Bird seed that falls to the ground serves the same way that breadcrumbs served Hansel and Gretel. A seed catcher not only prevents this, but it also minimizes waste. Now, as with all DIY projects, you need to invest time and skill. These are things that not everybody has. So, for those who would rather just buy squirrel proof bird feeders, just make sure to inspect these feeders thoroughly. This guide should give you a lot of information on how to select a squirrel-proof bird feeder.